Are you a developer in New York or London or considering to become one? This post analyzes recent data on IT job markets in these cities. It also points the advantages and disadvantages of working in these two cities as a software or web developer. New York and London share a number of similarities that go beyond their IT job markets. Both cities are considered as global capitals in financial and cultural terms. Both cities are also the headquarters of leading companies in almost all economic sectors, and are very attractive to highly skilled software developers. Recent events also play a role in the attractiveness of New York and London. The Trump administration and the Brexit might both attract and repel some IT talents, depending on their political views. Needless to say, New York and London offer some of the highest salaries in the world for software developers, and the unemployment rate in the sector is extremely low. Now, we will analyze the average salaries for different types of software development jobs in New York and London. 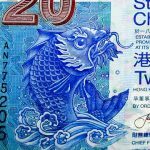 The sources for this analysis are listed at the bottom of the article. 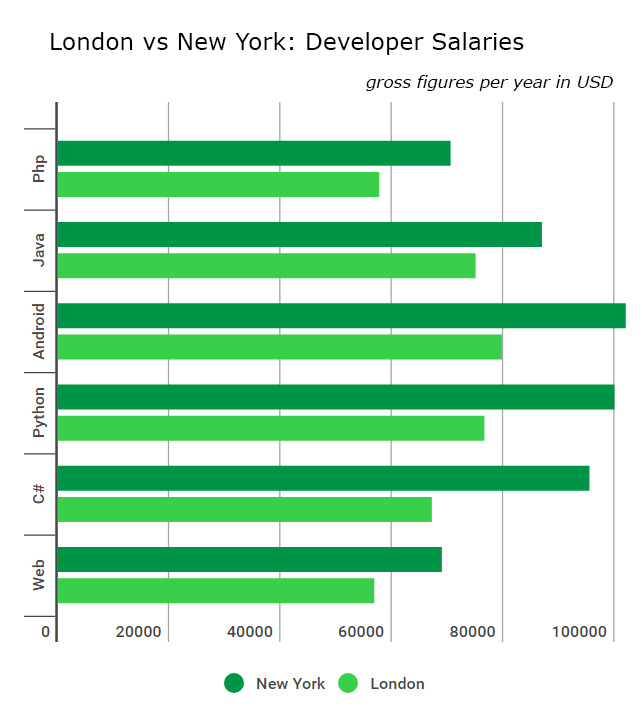 As we can see, salaries in New York are higher than in London for all types of developers analyzed in this chart. In fact, according to the data analyzed, IT salaries in New York are approximately 27% higher in New York compared to London. Even if New York has higher IT salaries than London, the British capital is a great place to work. It offers plenty of offers for all types of coders, and salaries are considerably higher than than the rest of the UK and virtually all European capitals. It is also important to consider that other factors play a major role in a software developer salary. Seniority is probably one of the main factors influencing wages, and multiple skills also add up for a higher pay. One can claim that London is a better place to live even if you can earn more in New York. Regardless of personal preferences, let’s take a quick look on the cost of living comparison between New York and London. According to this comparison on Numbeo, New York is considerably more expensive than London. The biggest price differences are when it comes to renting and grocery prices. The average rent prices in New York cost 43% more than in London, while groceries cost 61% more. However the local purchasing power is 20% higher in New York. Where would you prefer to build an IT career? Share your experiences below in the comments section.